Wisteria make a magnificent standard plant, for many gardeners this is one of the best ways to grow them. Wisteria are naturally a climbing plant, so to get the effect you need to ‘standardise’ them. This is a matter or training them to grow like a small tree. The are trained to grow on a single trunk and then give the appearance of a weeping wisteria tree. You can buy advanced or established Wisteria standards, and this is great way to great instant impact in the garden. The other option is to spend some time, and train your own plant. You will need a young plant, as these are easier to train. You can grow it and train it in the garden, or in a container using this simple method. Install a strong long lasting post, we suggest a metal support that you like the look of, as it will be with you for a long time. Once the post is installed, plant your young Wisteria near the base. Choose the strongest, most vigorous shoot and train it as a leader straight up the post, rather than allowing it to twine around the post. The straight stems are stronger that twining stems. All of the side shoots, lower down the stem need to be pruned off as they appear. After the first year of growth, the leader should be at the top of the support. When it reaches the right heigh you need to take the tip off the leader. Its then a matter of pruning the head back to around 15 cm (6 inches) each year to keep it as a weeping tree. The plant should be supported for at least 5 – 6 years as the single stem will not be strong enough to withstand winds along with the weight of the plant in full flowers. 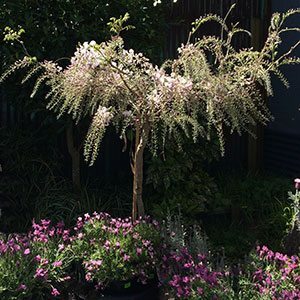 You can also train two different coloured wisteria together, or train the wisteria a a low tree with a trunk at 30 to 60 cms (12 – 24) inches tall. Fruit Trees, Roses, Perennials Rhododendrons and annuals. Includes advanced ornamental trees.